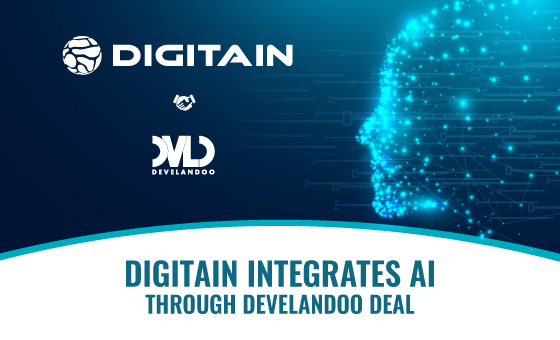 Digitain, one of the leading iGaming software providers, has signed an exclusive strategic partnership to integrate AI solutions in a joint deal with Develandoo, Artificial Intelligence Innovation Lab. This latest content agreement will see Develandoo integrate its AI solutions onto the Digitain platforms. Among the sections included will be trading Risk Management, Sales, CRM platform as well as production engineering projects. Develandoo will carry out all the iGaming projects exclusively through Digitain. To commence the development partnership, Develandoo shall establish three teams, totalling 27 qualified AI experts in the Predictive Intelligence, Natural Language Processing and Machine Learning areas of expertise, to roll-out various innovations. Leading iGaming space, Digitain provides Omni channel iGaming software solutions to the online, mobile and land-based verticals. Integration of Develandoo expertise into the Digitain core business model will leave its’ bold mark in the future of the company setting it apart from competing providers and providing exceptional product intelligence to its’ customers. Develandoo is the biggest consortium of AI and Data companies in Armenia, with a target to become the leading AI solutions provider in the region. Develandoo is an Artificial Intelligence innovation lab, specialized in building early-stage companies in Armenia. In 2014 they got their start creating a value-based company and entering the country’s fastest developing IT sphere. During the last years, Armenia has climbed to a level, leading the country in the area of information technologies in the EMEA region. They strive to create game-changing AI solutions in the areas of Banking, Insurance, Telecommunications, and Defense. Develandoo innovative models are well-known even beyond Armenia’s borders, across DACH, the US, LATAM, and MEA, as they have branches in Los Angeles and Munich as well. Digitain has more than 1,200 employees and 55+ global partners. The multi-channel Digitain Gaming Platform allows for a frictionless turnkey or white-label solution for both land-based and online operators via our API’s to integrate a sportsbook, casino, live dealer, and virtual sports modules. The stack also includes an extensive payment gateway, bonus engine, CRM system, and dedicated customer support 24/7. The sportsbook product covers 35,000 live events each month, across 65 sports taking in 7,500 leagues, and more than 3,000 betting markets, while our casino solution has 3,000+ games from the likes of Novomatic, EGT, Microgaming, and Playson and many more.